The 200 km square study area is indicated in the left-hand image and the radar footprints on the surface are indicated in the middle image for multiple orbits. 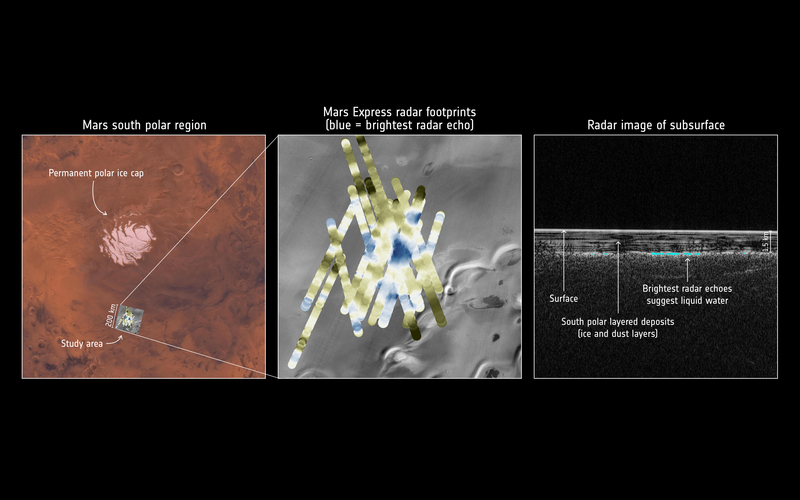 The greyscale background image is a Thermal Emission Imaging System image from NASA's Mars Odyssey, and highlights the underlying topography: a mostly featureless plain with icy scarps in the lower right (south is up). The footprints are colour-coded corresponding to the ‘power' of the radar signal reflected from features below the surface. The large blue area close to the centre corresponds to the main radar-bright area, detected on many overlapping orbits of the spacecraft. The brightest reflections are centred around 193°E/81°S in the intersecting orbits, outlining a well-defined, 20 km wide zone.